Ad Astra - ZineWiki - the history and culture of zines, independent media and the small press. 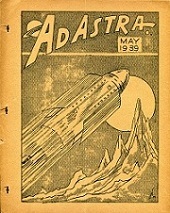 Ad Astra was a science fiction fanzine published in the United States by Richard Meyer and Mark Reinsberg. It ran five issues from May 1939 to November 1940. Two pages of the unfinished sixth issue appeared later in the fanzine Midwest Marky. Henry Bott, Leslie Croutch (Light), W. Lawrence Hamling, Erle Korshak, Julian S. Krupa, and Richard I. Meyer were also listed on the masthead for various issues. Contributors included Forrest J Ackerman (Voice of the Imagi-Nation), John W. Campbell Jr., Leslie A. Croutch, Hugo Gernsback, Jack Darrow, Jack Erman, Larry B. Farsaci (The Golden Atom, Stars), Joseph Gilbert (The Southern Star), J. Harvey Haggard, W. Lawrence Hamling, Charles D. Hornig (The Fantasy Fan), Erle Korshak, Henry Kuttner, Robert W. Lowndes, Robert A. Madle (Fantascience Digest), Gerald W. Meader, Richard I. Meyer, Raymond A. Palmer (The Comet), Clifford D. Simak, E.E. "Doc" Smith, Harry Warner, Jr. (Spaceways, Horizons), Art Widner (FanFare, YHOS), Jack Williamson, and Donald Wollheim (The Phantagraph). Julian S. Krupa was the art editor, and provided the cover art for four of the five issues, and some interior artwork. Mark Reinsberg was the chair of the 2nd World Science Fiction Convention in Chicago, known as Chicon 1, with Erle Korshak serving as secretary and Bob Tucker as treasurer. Later in the 1940s Mark Reinsberg and Erle Korshak went on to found Shasta Publishers with T.E. Dikty. This page was last modified on 6 January 2014, at 22:57.